A radical but rather elegant theory has been proposed by a Hungarian Physicist Ferenc Miskolczi (see refs) that the Earth maintains a maximised greenhouse effect to allow the Earth to cool as efficiently as possible. 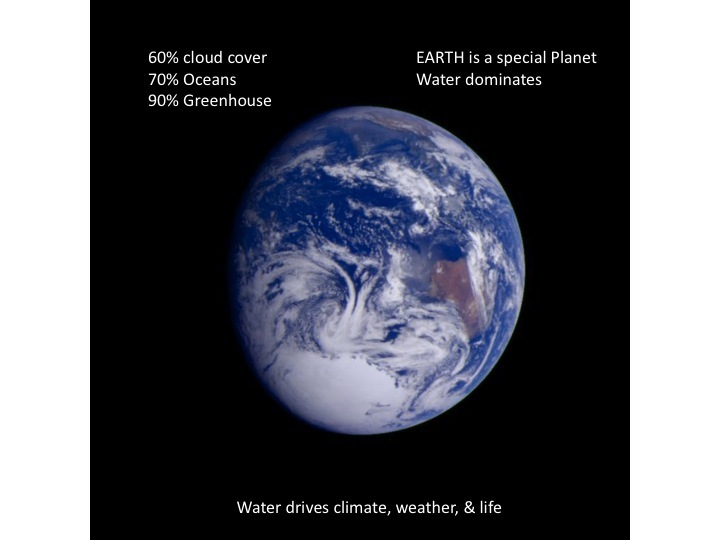 This self-regulation arises because 70% of the Earth’s surface is water allowing both cooling through evaporation (latent heat) but also warming through H20 being a greenhouse gas. Unlike CO2 the concentration of H2O in the atmosphere is governed by thermodynamic processes. Local thermodynamic equilibrium in the atmosphere ensures equality between the absorbed IR energy by all greenhouse gases from the surface and the IR energy emitted back to the surface by those same gases. Water evaporation and convection drives the Earth’s weather systems. Water Vapour also dominates the greenhouse effect of the Earth but has two subtle feedbacks. Firstly evaporation mainly from oceans is a very efficient way for the surface to loose heat through latent heat. However cloud formation then leads to a higher albedo and to night time heat retention so there is a play-off beween this and the greenhouse effect of H2O. Miskolczi and Zagoni argue that the total average greenhouse effect on Earth depends only on the input energy of the sun plus a small geothermal component. This simple conclusion is backed up by detailed radiation transmission model calculations and data comparisons. The total greenhouse effect remains exactly what is needed to maximise cooling of the Earth. Any man-made CO2 increases are simply offset by a small decrease in water vapour so as to maintain thermodynamic equilibrium. 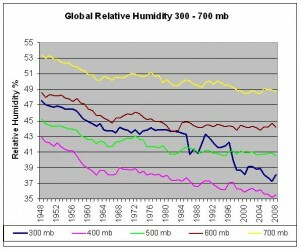 They claim that the data show there has been a small 1% decrease in global humidity to offset all CO2 increases caused by human emissions. 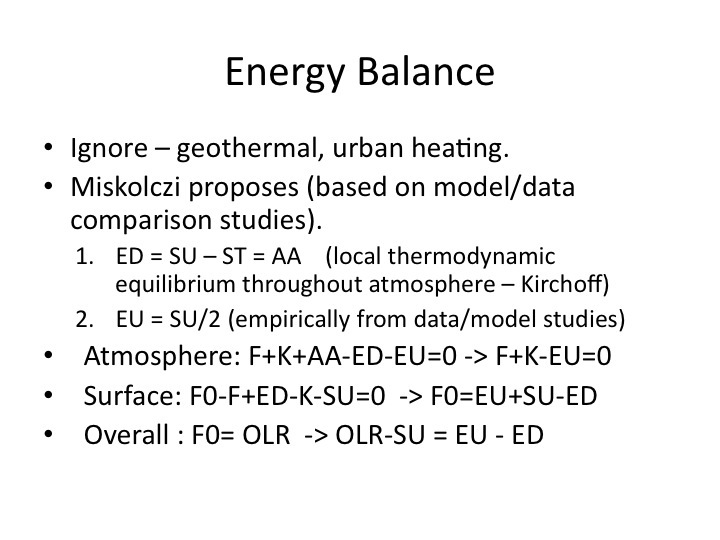 The following slides try to explain the energy balance arguements they make. The crucial proposal is that the water content of greenhouse concentrations (H2O + CO2 + CH4) are maintained to be such that half the IR energy radiated from the surface is emitted into space from the top of the atmosphere while another roughly 60 watts/m passes clean through the IR wavelength window. The physics motivation for this first proposal is the virial theorum which states that the kinetic energy (heat) of the atmosphere is half the (gravitational) potential energy. The effective radiative kinetic energy is associated with the IR radiation emitted from the atmosphere to space(Te**4). The effective potential energy is associated to the IR radiation emitted from the surface (Ts**4). The second proposal is that the amount of energy emitted back to the surface is equal to that absorbed by the atmosphere. This is based on an assumption of overall local thermodynamic equilibrium (Kirchoff law). 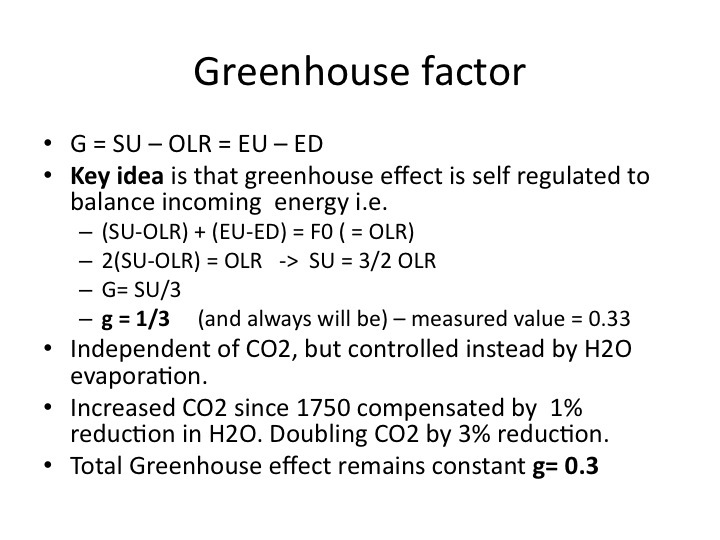 With these two assumptions the normalised greenhouse factor is and will remain equal to 1/3. The Earth’s temperature remains fixed unless the input energy changes through volcanic or human induced aerosols, or through changes in the Earth’s orbit. The temperature is however independent of any anthropogenic CO2 increases. Global Circulation models assume that rises in CO2 concentration lead to an enhanced greenhouse effect with rising temperatures causing yet more evaporation of H2O leading to an enhanced warming . This is the positive feedback which leads IPCC to give scary predictions of 3-7 degrees rise in global temperatures in the next 50 years or so. The effect of CO2 increase on the greenhouse effect alone would lead to less than a 1 degree rise. The Saturated Greenhouse theory says that exactly the opposite happens. The Earth has an infinite amount of greenhouse gas available to it in the form of water, but the average relative humidity today at the surface is 78% and just 37% at 9000 m. So why isn’t it 100% ? The reason Miskloczi argues is that energy balance between the surface and the atmosphere (Kirchoff: ED = AA ) plus a requirement that the kinetic energy of the atmosphere = 2* the potential gravitational energy (Virial theorum: EU = 2SU) causes a saturated greenhouse effect therefore limiting the Earth’s temperature to its current level. 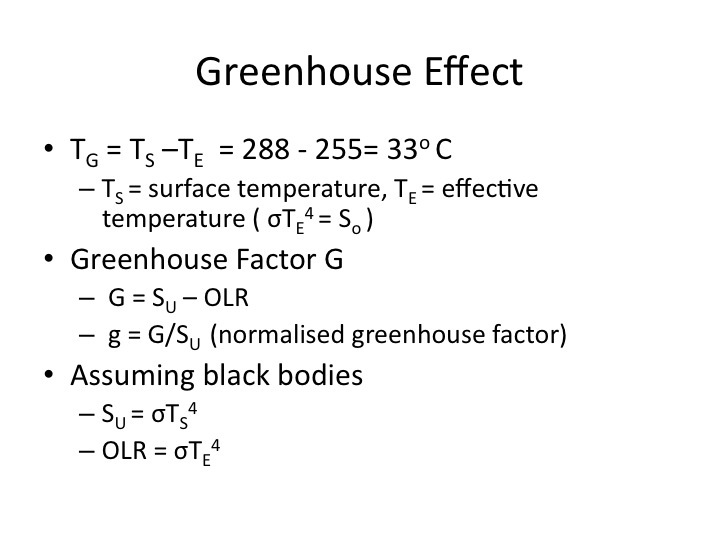 The normalised greenhouse effect = 1/3 and will always remain so and the Earth’s temperature remains constant unless the external energy parameters change (solar). Therefore to compensate for any rises in CO2 levels the Earth will adjust the relative humidity to maintain the same thermal equilibrium. The super El Nino effect in 1998 led to a rise in global temperatures. If it were the case that a temperature rise causes more water vapor through evaporation, causing yet more temperature rise, then one would expect temperatures to continue to rise after 1998, and result in a run-away effect. But the opposite happened, because temperatures fell as the greenhouse equilibrium mechanism restored the balance. The extra greenhouse gases rained out to restore the equilibrium. Miskolczi is arguing that exactly the same effect is happening now as has happened in the past with any sudden perturbation in CO2 levels. 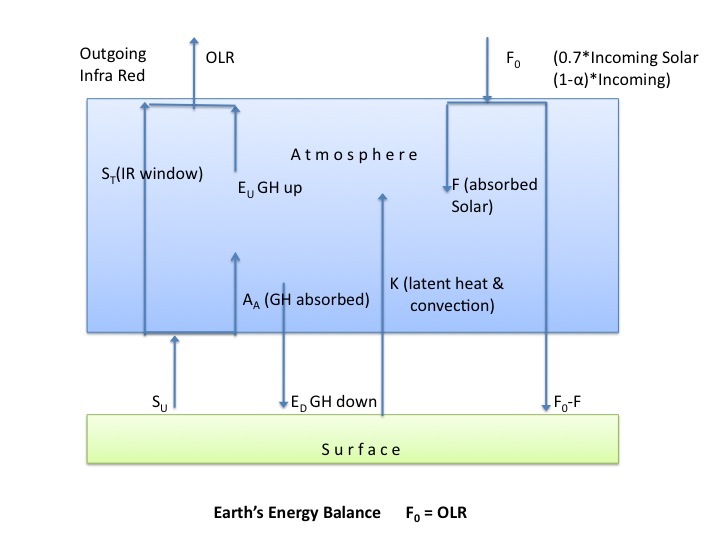 Energy balance of the Earth/Atmosphere will cause water vapour content to increase or decrease in order to maintain an equilibrium situation with a saturated greenhouse effect g=1/3. In order to offset a potential doubling of atmospheric CO2 levels caused by human activity the relative humidity would reduce by 3%. Miskolczi claims that existing data show that already a global reduction of 1% in relative humidity has occurred over the last 100 years. 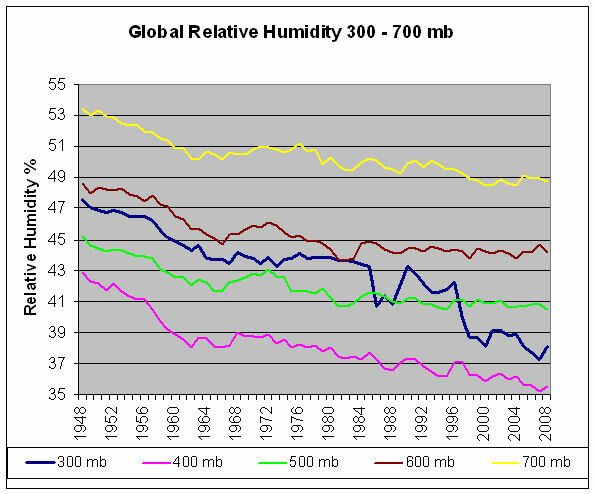 Data from NOAA Earth System Research Laboratory for the upper atmosphere show that relative humidity has indeed been falling. This theory depends on the two assumptions of local thermodynamic equilibrium (Kirchoff) and the applicability of the Virial theorem to the radiation fluxes from the surface and the top of the atmosphere. Mainstream IPCC scientists have all attacked this but direct measurements do really seem to support these assumptions. The pressure distribution of the atmosphere is a function of gravity and temperature P(h)=Po*exp(-mgh/kT). The effective black body radiation emitted by the atmosphere to space by greenhouse gases is a kind of measure of it’s “greenhouse” temperature and hence its kinetic energy, whereas the radiation emitted from the surface is related to the Po the pressure at height zero and hence the gravitational potential energy. I certainly will need to think harder about this one to be convinced, but the theory is very attractive and if true would completely overturn mainstream climate change predictions. Ferenc M. Miskolczi, “Greenhouse Effect in Semi-Transparent Planetary Atmospheres“, Quarterly Journal of the Hungarian Meteorological Journal, Vol. 111, No. 1, January – March 2007. This entry was posted in Climate Change and tagged CO2. Bookmark the permalink. Hi buddie, I’m just browsing the web looking for some info and saw your blog. I am engraved by the content that you have on this blog. It reveals how well you understand this subject. Bookmarked this website, will get back for more. You, buddy, ROll!!! Everything About Fitness, Diet, and Health Related Issues. It seems to me that so-called “climate science”. insofar as “AGW”, anthropogenic global warming, is concerned, largely loses the thermodynamic forest for the CO2 trees. radiative atmospheric energy transfer are determined by the very lowest and the very uppermost parts of the atmosphere. of the journey to space do not matter much at all. the thermodynamic die is cast. magnitude of “green house” warming. Is this surprisingly simple perspective basically correct? Basically I think you are right. The atmosphere has always been opaque to CO2, which means there has allways been a thick fog covering the Earth’s surface for infrared (heat) photon. By Increasing CO2 in the atmosphere Man merely raises the height in the upper atmosphere were heat eventually escapes to space – a small energy loss. These are at such low temperatures that the warming effect is logarithmic which means that doubling all man made emissions of CO2 since the industrial revolution may cause another 0,4 degrees increase in temperature. The apocalyptic predictions are all based on a positive feedback with water vapour. So if temperatures rise a bit then more water evaporates from the oceans causing enhanced greenhouse effect – because water vapour is the driving force of weather – not CO2 ! However some experts predict the opposite – more water vapour leads to more clouds and rain to cool the planet ( Miskolczi included). To date there is no strong evidence of a CO2 warming signal in the upper atmosphere which is where it really should be present. Time will decide – egg will yet fall on faces. that that is the case. a science blog if that is your direction? as do the fluxes of CO2. We can then maybe argue that it must be somehow our fault. So humans have changed land usage as well – reducing vegetation and thereby effecting the natural balance. However note that this is a different arguement which has nothing to do with curtailing direct CO2 emissions. My main argument is that even if we do assume that the recent rise in CO2 levels is entirely due to man, then the effect on global temperatures are small and the alarmist predictions of the climate change vested interests over-hyped. “…We can then maybe argue that it must be somehow our fault. So humans have changed land usage as well – reducing vegetation and thereby effecting the natural balance. show nearly the same natural fluxes. “accumulation” nonsense drags on and on. It could have been laid to rest a long time ago. it is that the “Warmist” masses do. In science, the majority does NOT rule. numbers the IPCC has been bandying about. too small to even measure. I now agree that the evidence suggests that the lifetime for CO2 in the atmosphere is about 5 years. The argument of Segalstad and others is rather convincing [ http://www.co2science.org/articles/V12/N31/EDIT.php%5D . So yes this would mean that only about 5% of the CO2 content of the atmosphere is caused by humans and 95% is natural. 1. The rise in CO2 seen since 1959 is caused by the slight rise in global temperatures and AGW is wrong. This is what happened during previous Ice ages absorbing more CO2 as the ocean cools and outgassing CO2 as the oceans warm. 2. The small extra 4% perturbation in the flux of CO2 has changed a “perfect balance” between inflows and outflows of CO2 such that 2%(half) of CO2 is not completely absorbed each year. (Of this 2% still only 4% of it is anthropogenic). However the seasonal flows between summer and winter are far larger than this 2% change. For AGW to remain valid then 2) would have to be true, but than this raises another question. What possible mechanism can there which maintains such a perfect carbon cycle balance involving so many different processes – resulting in just 0.03 % CO2 molecules in the atmosphere ? Regarding the direct greenhouse effect of doubling CO2 – I got 0.8 degrees for the effective warming using the radiative code MODTRAN [ http://geoflop.uchicago.edu/forecast/docs/Projects/modtran.html ]. An interesting point in all this is that the atmosphere becomes opaque at just 50 ppm so you can use the doubling argument for 50-100, 100-200, 200-400, 400-800 . In other words 4 doublings or 2**4 increase in CO2 gives an effective temperature rise of 3.2 degrees. If you remove all the CO2 from the atmosphere the Earth would be instantaneously 3.5 degrees cooler but life would stop. We seen to be mostly in agreement. warming due to doubling the CO2. 1. Could you tell me exactly how I can also use it.? you can use the doubling argument for 50-100, 100-200, 200-400, 400-800 .
effect of the previous doubling. Not sure, but, quite sure on this. The parameters are defaulted to clear skies in the tropics with a surface temperature of 26.7 C To understand the effects of increasing CO2 concentrations we can leave these values and change the concentration. click ‘submit the Calculation’ – we get a spectrum with outgoing IR of 287.84 W/m2. This gives energy balance with incoming solar radiation. 1. Lets double the CO2 concentration so make it 750 ppm and run it again. We now get IR out = 284.67 – i.e. the extra CO2 has reduced heat loss – the greenhouse effect. Therefore the Earth surface heats up to restore the energy balance with the incoming solar radiation – 287.84 W/m2 as before. 2. Increase the Ground T offset by 0.8 degreesC . Now we get the same IR outgoing as before (287.53 W/m2). This means that the direct greenhouse effect of doubling CO2 levels to 750 ppm is to warm the earth by about 0.8C. 3. You can try other combinations i.e. removing ALL CO2 to find that the Earth would be about 7.5 degrees colder than today. However, life would be impossible with concentrations much below 200 ppm as plants will die off. to follow up on what you have provided. the danger oft man caused CO2? Miskolczi’s theory has many flaws. The series of articles starts with The Mystery of Tau – Miskolczi. The author himself shows up and admits certain equations that were invoked to propose his theory are actually “the results”, and not fundamental theory at all. Part Five – Equation Soufflé gets into the guts of “the theory” and demonstrates it is a Dog’s Breakfast with many fundamental problems. Essentially, it is a derivation based on a very simple model of the atmosphere with no convection which has been anyway misused and incorrectly derived to produce some conclusions. Obviously, in the light of the flaws, the conclusion can no longer be held. Finally we get to see water vapor trends to find they haven’t been reducing – as best as we can tell from the evidence – and it is only reanalysis models, or one reanalysis model (NCEP/NCAR), which claims this. I tried reading Miskolczi’s paper and must admit that I couldn’t follow his equations either, and I also read your critique of his work. However, what I still find intriguing is that even though Miskolczi may not have actually proved it – there must be a natural mechanism which maintains atmospheric concentrations of greenhouse gasses such that g=1/3. Venus has 95% CO2 whereas Earth has 0.03% CO2. The reason is obviously that we have liquid water, and Venus doesn’t thereby leading to life etc. My gut feeling is that there must be a simple yet subtle feedback within the Carbon cycle leading to just the right mix of CO2 (and water vapour) making conditions perfect for life (Gaia). Therefore I would not yet reject Miskowski’s proposal that the Earth somehow maintains a maximised greenhouse effect with G=SU/3 over eons. What leads you to this conclusion? 1. We don’t actually have reliable data from 1948, but if we do the calculations from say 1973 then with increasing water vapor his optical thickness calculation will not show a constant value. 2. He ignored other GHGs like methane, nitrous oxide, CFC11 etc. If we add in their changed concentration we also find increased optical thickness of the atmosphere over the past 40 years. 3. In any case, others have commented in the articles that his statistical analysis is flimsy and even demonstrating roughly constant values over a small time period doesn’t in any way demonstrate that these same parameters will continue to be constant under new conditions. Let me give you a simpler example on point 3. Suppose I measure the temperature outside my house every day for 10 years. Suppose I plot a graph and say, look it’s been changing, but over a decade there isn’t really much trend line, in fact, the trend line has a 50% chance of being zero. Therefore, temperature will never increase! I have proven the temperature outside my house to be a constant. What would you think of this analysis? I think you have won the argument regarding the inconsistency of Miskolczi’s argument for what he proposes. However I was thinking of something much more general. Forget about AGW and CO2 emissions and politics. My basic question is : Why does the Earth’s climate maintain such a low CO2 concentration in the atmosphere ? Why has it stayed around 0.03% for the last million years ? Correct me if I am wrong but as far as I know no climate model predicts this value. Suppose the Earth was 90% Ocean or just 10% Ocean. I am sure that in this case the CO2 concentration would change completely? We also know that when the continents were joined together 50-100 million years ago we had much larger CO2 concentrations – for example when the dinosaurs were alive. So I suspect there must be a principal at work here whereby the distribution of water on the Earth’s surface determines the CO2 concentrations in balance with the distribution of life and vegetation. Now I really would be impressed if a climate model was able to predict this value. It would actually be interesting to take say the Hadley models now and input the topology of Gondwanaland and see what happens ! Is that even possible ? efficient in getting rid of the sun’s heat. or, if you prefer, that Su = 3/2 OLR. comes from the 2nd Law..
and build theory with them as premises. by having another go-around with Miskolsci. Good to hear again from you again James ! I have been looking at climate sensitivity from a different angle and agree that water feedback is negative. The evidence comes from both the Faint Sun paradox see here and from looking at differences in temperature response between Arid areas and Humid Tropics using the latest global temperature data. This gives a sensitivity to a doubling of CO2 of around 0.2-0.6 deg.C. Positive feedback looks highly unlikely. Even with zero feedback temperatures would rise by only about 1 deg.C – which could be beneficial to mankind. Likewise. Nice to hear from you! Pingback: Miskolczi discussion thread | Climate Etc.